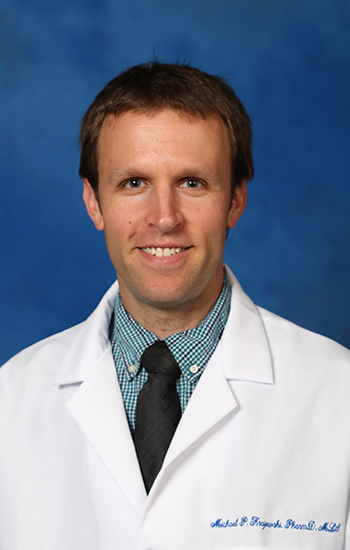 Dr. Krajewski joined the faculty in 2012 after completing a PGY1 residency at the Buffalo Veteran Affairs Medical Center. He is a 2011 University at Buffalo graduate. His primary focus is retrospective drug utilization review (RetroDUR) as a part of the collaboration with the New York State Department of Health. He also has a faculty appointment within the University at Buffalo School of Dental Medicine where he has regular clinic hours performing medication reconciliation for patients of the dental clinic. His research interests focus on drug utilization, underserved populations, and transitions of care best practices. Conway EL, Sellick JA, Horey A, Fodero K, Ott MC, Krajewski MP, Mergenhagen KA. Decreased mortality in patients prescribed vancomycin after implementation of antimicrobial stewardship program. Am J Infect Control. 2017. Fodero KE, Horey AL, Krajewski MP, Ruh CA, Sellick JA, Mergenhagen KA, Sellick, Jr JA. Impact of an Antimicrobial Stewardship Program on Patient Safety in Veterans Prescribed Vancomycin. Clin Ther. 2016. Krajewski MP, Doloresco F, Wrobel M, Chiarella D, Fominaya CE, Brody PM, Catanzaro LM. Literature searching skills of first and third professional year pharmacy students. Pharmacy Education. 2013; 13(1). Mergenhagen KA, Olbrych PM, Mattappallil A, Krajewski MP, Ott MC. Effect of azithromycin on anticoagulation-related outcomes in geriatric patients receiving warfarin. Clin Ther. 2013; 35(4). Krajewski KC, Smith K, Conwall K, Krajewski MP. Achievement of therapeutic anti-Xa levels in a proven heparin-resistant patient through the use of nontraditional high-dose enoxaparin. Ann Pharmacother. 2015; 49(1).